Are you looking for an exciting night out? Are you a fan of games that allow you to win big prizes? Then Grand Victoria Casino is the place for you. 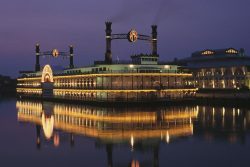 This stunning casino is right by the Fox River, and is filled with over 1,000 different slots. There are also a variety of other fun games, including: splitting aces, blackjack, live poker, baccarat and more! If you get hungry in between slots, you’ll definitely want to check out Prime BurgerHouse, Buckingham’s Steakhouse and Lounge, Crave Deli or Indulge Show Kitchen Buffet. The food at every single one of these restaurants is absolutely delicious! If you are looking to really take your trip to the next level, make sure to check out the different promotions that are coming up, like their Subzero Slot Tournament. Grand Victoria Casino is the perfect place to win big money, and have a blast while doing it! Booking Howl2GO Dueling Pianos’ world class show to your Elgin, IL event couldn’t be simpler. From conventions to corporate events, weddings to fundraisers, our unbeatable Dueling Piano shows bring a high energy, interactive show that your guests will remember for years to come anywhere in Illinois!